HISD’s Chief Academic Officer Daniel Gohl presented a comprehensive literacy plan to the Board of Education on Thursday. The plan, Literacy By 3, engages students, teachers, parents, and community members around a common goal: having every student reading with proficiency by Grade 3. This entry was posted in Literacy, News and tagged family and community engagement, literacy on April 17, 2014 by HISD Communications. HISD will be reviewing and modifying the district’s literacy plan known as CLASS over the next several months and evaluating individual school programs for effectiveness. This entry was posted in Early Education, Elementary Schools, High Schools, Middle Schools and tagged literacy on January 16, 2014 by HISD Communications. The Houston Independent School District performed better than most large urban school districts in math, showing increases across all student groups compared to 2003, while reading scores remained unchanged, in the National Assessment of Educational Progress (NAEP) report released Dec. 18, 2013 (http://nces.ed.gov/nationsreportcard/). This entry was posted in Uncategorized and tagged literacy, mathematics, NAEP on December 18, 2013 by HISD Communications. Houston ISD principals traditionally collaborate via email and at meetings, but today they’re chatting online and hope you will join the conversation. The district’s first Twitter chat, which will be held from1:30 to 2:30 p.m., will focus on literacy. You can be part of the conversation by following #HISDprincipal. We’ll offer a live feed on the district’s website. If you have a comment or question, chime in by logging into your Twitter account on your computer or mobile device, and send your Tweet with that same hashtag. This entry was posted in Special events and tagged literacy, principals, Twitter chat on December 6, 2013 by HISD Communications. T.H. 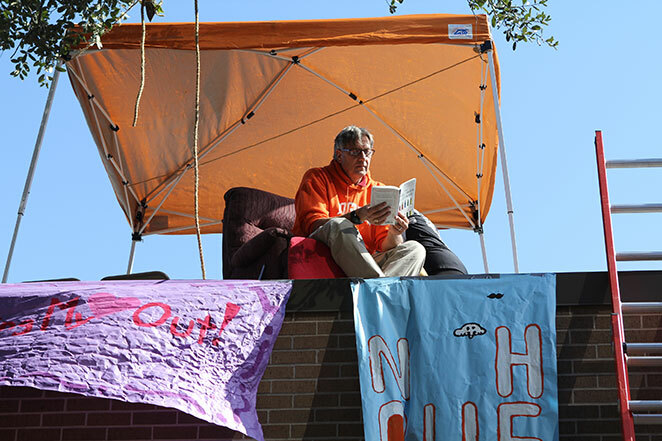 Rogers Middle School principal David Muzyka spent the entire day on the roof of his school reading to students in the courtyard below. Last year, BOOK IT! challenged every school principal in the country to “read your heart out” during National Young Readers Week. This year, the organization sent out a new Principal Challenge, and Muzyka accepted, braving gusty winds and an approaching blue norther, to show his students the value of reading aloud. This entry was posted in Literacy, Middle Schools and tagged literacy, TH Rogers on November 12, 2013 by HISD Communications. The Houston Independent School District has received a significant donation from Target Corporation (NYSE: TGT) to fund the THINK Literacy program at the Apollo 20 elementary schools in support of the district’s efforts to increase achievement in literacy. The grant will provide books for more than 60 first-grade classroom libraries at the 11 campuses on September 4. This entry was posted in Elementary Schools, Literacy and tagged Apollo 20, Blackshear, Davila, elementary schools, Frost, Highland Heights, HISD, Houston ISD, Isaacs, Kelso, literacy, robinson, Scarborough, Target, Tinsley, Walnut Bend, Young on August 30, 2013 by HISD Communications. More than 12,000 HISD students will be starting off their summer vacation right—with an armload of books to take home, enjoy, and keep—thanks to two book-loving ladies and the non-profit they created last year to support literacy. 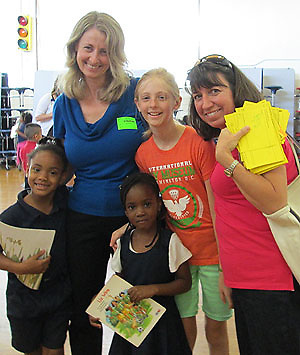 “Building home libraries, one summer at a time,” is the slogan of Books Between Kids, which Sandra Ahlhorn and Amy Barnes cofounded in 2012, and that is precisely what the longtime friends (and parents of HISD students) intend to do. This entry was posted in Elementary Schools, News and tagged books between kids, literacy, reading, summer on June 10, 2013 by HISD Communications. HISD's Parent Engagement department says the reaction to the Parent Book Club has been so popular, they're looking at expanding the program to other schools. In an effort to promote the importance of parental involvement and literacy simultaneously, the HISD Parent Engagement Department has launched a new Parent Book Club. This entry was posted in Parents, Uncategorized and tagged literacy, parent engagement, parents on March 12, 2013 by HISD Communications. HISD’s Director of Literacy Carol Bedard has been honored along with two of her colleagues by the National Council of Teachers of English. Dr. Bedard, who serves as an associate professor at the University of Houston Downtown in the Department of Urban Education, shared the role of co-editor on a prize-winning article with fellow faculty members Kim Pinkerton and Leigh Van Horn. The article, entitled “English in Texas,” won first place in the Affiliate Journal Awards. This entry was posted in Achievement/Recognition and tagged Bedard, Department of Urban Education, English in Texas, Kim Pinkerton, Leigh Van Horn, literacy, National Council of Teachers of English, University of Houston Downtown on September 7, 2012 by HISD Communications.